Guess how I created this card! 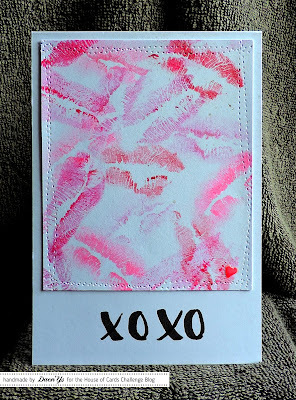 there are lips on the photo - what if I used my lips to create my card?? ......did not find it too bad! So I went to the full-scale test and kissed my paper several times with different inks - and voilà the result! .....but imagine the state of my mouth - it looked like I had fallen into a pot of paint! hahaha. I added a tiny heart in the lower right corner and I wrote XOXO by hand. Now it's your turn - we look forward to your creations for Valentine's Day! Beautiful card Rosi! Love the way you created your background! So creative! LOL, the things we do for our craft! And here I was, excited to find out where you found such a realistic-looking stamp. :P Now I know why it looks so good! Thanks for joining us at Naughty or Nice Challenges! Tsk, tsk, tsk, Du solltest doch vielleicht lieber Deinen Mann kuessen.....Sonst laesst er Dich bald nicht mehr basteln, kreisch! Gorgeous card. I wish I could have seen your face after this was made, hope they didn't taste too bad, love it!